JayC, a long time customer of mine since 2010-2011 finally decided to put his car on E85. He was so happy with the power it made given the restrictions there, 18psi WGA + single walbro, that he took the car to the track. As the title says, car went 10.71 @ 129 with only 480WHP in my vd. Car ran out of fuel. 480WHP is the absolute max you can do on a modded walbro before entering to lean of AFR's on E85. Passes were done on Hoosier QTP's. Car had seats removed for track and race weight roughly 3100lb with driver. With more fuel and more boost, this car has a whole hell of alot more in it. Last edited by tscompusa; Jun 17, 2013 at 04:54 PM. I swear any car with Kelford 272's run like a bat out of hell on the track where as S2's seem to be "dyno queens". Great job! Nice times! Good driving for sure. well i would be installing some s2 sir and i hope they do even better than the kelfords.As long as it puts the power to the dyno track results should be accordingly as well providing driving is good and consistent .Kudos to you tom very impressive for under 500whp, what more can someone ask for . i know i was just as shocked when i seen the track times as you guys are. I am having trouble getting back into contact with the owner. He is in the military and he is in the middle of moving to Hawaii right now. I will post the video and slips as soon as i get them. He removed the interior seats, and put on drag slicks + light weight wheels and from there im not sure. but the car is somewhere around 3100lb with the driver in it, so its quite light vs stock. Very nice job. Couldnt you get it to hold better at redline with that bcs? Blacks shouldn't drop off that much, right? With my fp black hitting 34lbs it dropped to 31-32 by 8k and that's with a hallman. Or was that because the fuel pump can't keep up? These are awesone times, so roughly 425whp mustang. Did he want his torque to be that low? My car weighs 3150 with me in it. So I am not far off from this guy and I also have 17 inch rpf1s, I wonder if I drive my *** off if I could break VERY low 11s with 400whp mustang and more torque than this guy. Ya we could, but as you just mentioned, i didn't because of the afr and fueling issue. the car was out of fuel entirely by 480whp. theres much more power in it with more boost up top, but it would need a hardwired walbro 400 or a double pumper to safely do so. 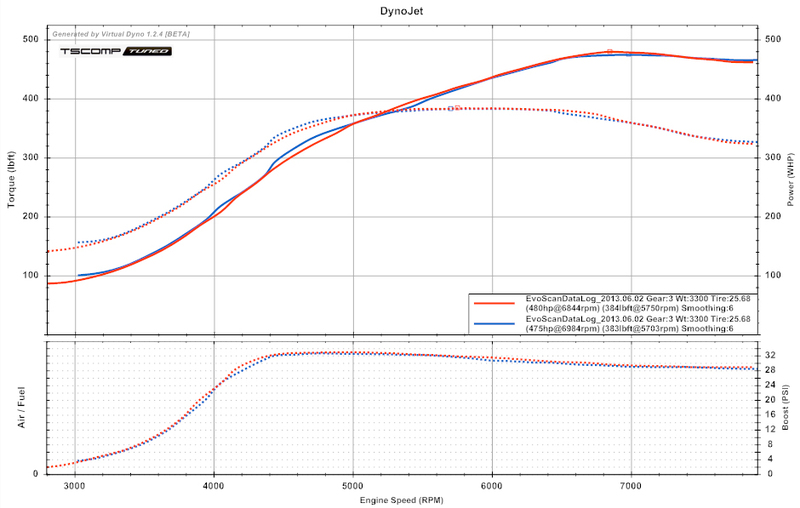 Was your 506 in sig dynojet? standard for a mustang is 8% lower than a dynojet. some do read different though higher and lower. AMS is 8%. its a stock block, so yes torque should be kept low. 380tq is not low for a stock block. its about the max safe limit you want to go and thats from my experience tuning hundreds of these cars. if you want a worry free tune thats going to hold up on stock internals, then 380tq would be still in the comfort zone. i've taken them past 500tq, but that isn't something i'd recommend for longevity. the owner got back to me but can't provide any data right now as hes in the middle of being sent to Japan for a few months for work. then after Japan he goes to Hawaii lol. he did say the 60ft was a 1.56 though. Last edited by tscompusa; Jun 20, 2013 at 08:34 PM. it was scaled to reflect a local dynojet dyno when I lived near Vegas. It was done on a dynapak however. Tom is the owner running on stock valve spring here since i see stock valvetrain?I ask this because i bought the s2 cams and was thing of running stock valve springs as well even though i already bought the springs just think it will cost more to install and time as well.My goal is just around this power band so if i can safely getaway with not having to change my valvetrain will be nice thanks. no its running kelford beehive springs & retainers. you really should do the springs and retainers on anything bigger then stock. Keep in mind, it's a very flat 480hp where a peaky 500hp car would probly run slower on the track. Impressive! I love flat power curves.